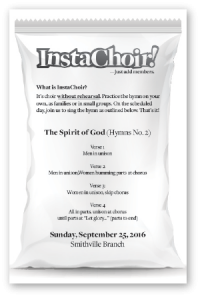 Salt Lake City, Utah – September 20, 2016 – LDS ward choir directors can access free LDS hymn arrangements from composer Steven Smith via the newly redesigned SoundsmithMusic.com. There’s nothing unusual about free LDS sheet music for ward choirs. A quick Google search brings up dozens of sites like DeFordMusic.com or FreeLDSSheetMusic.org. But what makes Soundsmith Music unique is Smith’s association with the Mormon Tabernacle Choir. Steve began preparing music in 1995 while still a student at BYU. Mack Wilberg, then director of the BYU Men’s Chorus and Concert Choirs, became his primary client. As Mack transitioned from the university to the tabernacle, Steve’s work with the Choir and Orchestra at Temple Square blossomed into a career that now spans more than 20 years. 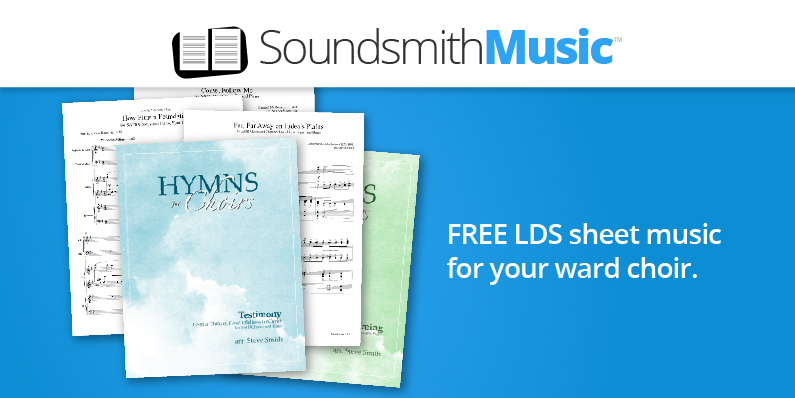 SoundsmithMusic.com first launched in 1996 to a worldwide audience of LDS ward choir directors. Then, many downloaded his “free LDS sheet music” and offered enthusiastic feedback. Because of a growing family and other responsibilities, Smith temporarily retired the website in 2012. His 2016 relaunch includes improved versions of his original arrangements and new settings of familiar LDS hymns and children’s songs. 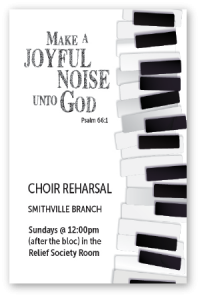 The new site also hosts many of Smith’s popular Christmas arrangements, just in time for fall rehearsal. Additionally, Smith offers advice for ward choir directors via the new site’s blog. 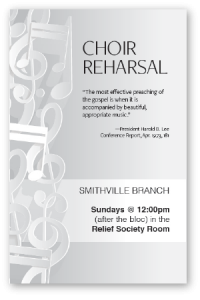 “Over the years, I’ve learned a lot about how to build a successful ward choir,” Smith says. He hopes to help new ward choir directors, especially those with little or no musical training, find solid footing. 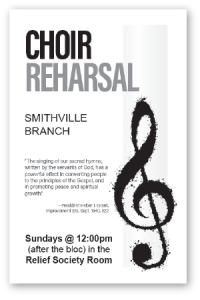 Perhaps, Smith muses, lessons learned in working with “the” church choir will help many church choirs found in LDS wards, stakes, and branches around the world. Created in 1995 by composer Steven Smith, Soundsmith Music provides professional composing, arranging, and music preparation services for choirs and orchestras worldwide. Clients include the Mormon Tabernacle Choir, Orchestra at Temple Square, BYU, Telarc Records, Deutsche Grammophon, and Oxford University Press. Steven studied music composition at Brigham Young University. He provides the primary music preparation services used by Mack Wilberg, director of the Mormon Tabernacle Choir. In addition to creating LDS sheet music for ward choirs, Steven works with religiously unaffiliated choirs and orchestras throughout the U.S. His musical leadership includes numerous community choirs, orchestras, and ensembles throughout Utah and Cache counties. Steven’s musical theater work includes stage adaptations of Heidi, Max Lucado’s You Are Special (The Wemmicks), and The Legend of Sleepy Hollow in Concert, a Stories in Concert™ production. He currently resides in Mendon, Utah with his wife and four children. Thank you for providing this resource for choir directors. I have been running into problems accessing your “Free LDS Sheet Music” page. Every time I go to that link, right after loading, a subscribe screen comes up, and there is no way to close the screen to access the download links. At first, I assumed subscribing was a requirement to access the links, so I subscribed. But still, the subscribe screen comes up every time I access that page, and I can not get past it. Oh, I’m so sorry! That’s not how it’s supposed to work. Do you have cookies disabled? If you dismiss the popup, it’s supposed to go away for at least 30 days, but to “remember” that requires cookies, I think. I made some updates and I’m working on a new version of this that isn’t so annoying. In the meantime please let me know if you still can’t access it. Thanks!